Best selling investment author Bill Bonner is the founder of Agora Publishing, one of the world’s most successful consumer newsletter companies. Today’s article in Daily Reckoning says a lot about where the world is heading. Buttocks must be subject to the same law of declining marginal utility as everything else, we concluded, just after midnight. There must have been 10,000 of them, sweating, shaking, quivering, and vibrating in the Sambadrome last night. The costumes were over-the-top, unrestrained, immodest as you might imagine. The idea seemed to be to put on as many sequins and as many feathers as possible. Then, amid the gaud and glitz of the get-up, typically, the rear end was left open, to reveal the shimmering cheeks. As we made our way to the Sambadrome, we began to suspect that this was not going to be just like any other night out. Crowds filled the streets and pavements all over town. One young man was retching on the curb. A young woman had passed out; her friends were slapping her to try to get her back to consciousness. A little further, another man was being loaded onto a stretcher, ailment unknown. And on a back street outside the stadium, two women had gotten into a fight, cause likewise unknown. 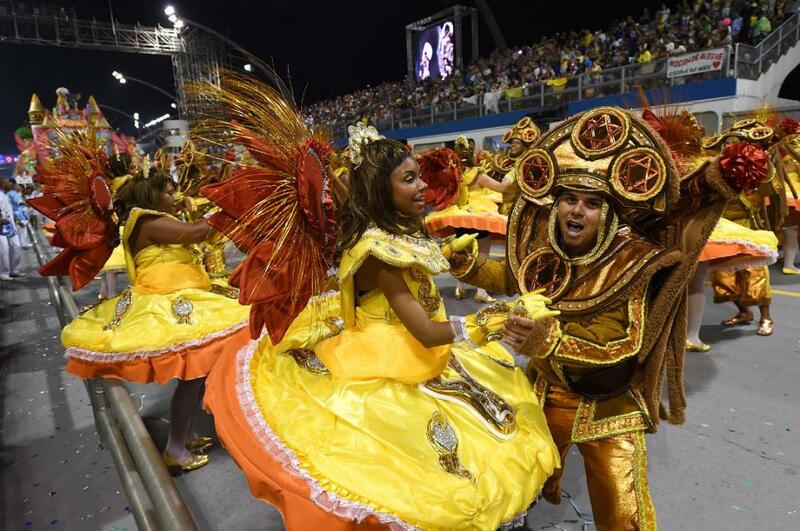 Carnival in Rio: the whole city has let its hair down. We were in the elite section of the Sambadrome. Our fellow spectators looked a bit like the crowd you’d find at one of Baltimore’s slick eateries in Cambden; young, professional, good looking. The men looked like they might be stockbrokers during the week. The women might have been models. Sleek, attractive… some trophies, many still competing. Scarcely had we arrived when the music began. We missed the bombing of Dresden and the collapse of the World Trade Centers, but it’s hard to imagine that the decibel level was much higher. Meanwhile, waiters circulated with trays of drinks. They were determined to give you one, whether you wanted it or not. The idea seemed to be to increase the noise and inebriation level throughout the night; no one should wake the next day without thinking he had a good time the night before. Everyone would have the pounding head to prove it! The parade took a long time to reach us. And then…wowee! Baffling, outrageous and over-the-top, maybe Carnival isn’t as far from finance as I thought. Yes, that’s right. There is no longer any obvious, effective limit on the amount of ‘money’ the central bank can create or ‘lend’ to the government. We put those key words in quotation marks, simply to indicate that it would take whole volumes to understand what they actually mean. There, of course, is the problem. The system is so novel and so nuanced that nobody really knows what is going on, least of all the people who claim they have it under control. Yes, it’s a funny old world. Among the funniest things about it, circa 2015, is that the smarter you are, the harder it is to understand our money system. Martin Wolf, Paul Krugman, Joseph Stiglitz, Larry Summers — ‘brilliant’ men, we are told, every one of them — don’t have a clue. They are victims of their own brainpower, confident that they can figure it out as they go along, adjusting monetary policy to the needs of the moment. Is that the way it works, dear reader? Can you just make it up as you go along, reacting first to one event, then to another? We don’t think so. What happens is that one conceit leads to another. You are like Napoleon on his way to Moscow, Gideon Gono on his way to hyperinflation, or a wayward husband on his way to a noonday tryst. One decision seems pardonable, under the circumstances. Then, the circumstances trap you. You would prefer that it were different. You’d like to back up. You’d like to take a different course. But it is too late. ‘Under the circumstances’ you do what you have to do. Then, finally, you find yourself in Hell. You’ve overdone it. Bill’s report shows a world out of control. A world that has rejected God and His rule. A world under judgment.